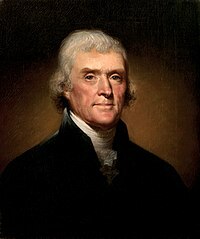 Thomas Jefferson (April 13, 1743 – July 4, 1826) was the third President of the United States. He wrote the Declaration of Independence while others signed it and wrote the Statute of Religious Freedom. He was also a planter with many slaves, though he often fought for their freedom. Jefferson, the third of ten children, was born on April 13, 1743 in Shadwell, Virginia into a planter family. His parents were Peter and Jane Jefferson. He had six sisters and three brothers. At 9 years old, Thomas Jefferson began studying Latin, Greek, and French; he also learned to ride horses, with highest honors. He went on to become a lawyer. In January 1772, Jefferson married Martha Wayles Skelton, with whom he had 6 children. Jefferson wanted the Thirteen Colonies to be free from Great Britain. Jefferson quickly assumed a leadership rule among like-minded men of his generation. He was a member of the Second Continental Congress. He was chosen to be in the group of officials that wrote the Declaration of Independence and was its main writer. He was minister to France from 1785–1789. He was selected by George Washington as the first Secretary of State. Jefferson thought that the federal government should be small. He had the opposite view of Secretary of the Treasury Alexander Hamilton about the federal government. Together with James Madison in 1792, he founded a party to oppose Hamilton and the Federalist Party. This party was the Democratic-Republican Party. One fraction of the party became the modern-day Democratic Party. Jefferson ran for president against John Adams. He got the second highest number of votes and, as was the law at the time, became vice-president. Jefferson ran again as the Democratic-Republican candidate in 1800 and got a victory. He was elected again in 1804. Jefferson made the Louisiana Purchase, which doubled the size of the United States. He sent the Lewis and Clark Expedition to explore the land the United States got by the Louisiana Purchase. Jefferson had to deal with the threat of war during his second term. Great Britain and France were at war for almost all of his time as president. Each side did things that could have made the United States enter the war. Jefferson worked hard to keep the United States out of the war and not be a part of it. Jefferson passed the Embargo Act of 1807, which made it illegal for the United States to trade with other countries. This upheld his isolationist policy, or separation from the rest of the world. This temporarily hurt trade, but in the long run it made American businesses stronger. Jefferson started the University of Virginia. The British burned Washington D.C. (or the Capitol building, as it was known,) during the War of 1812. When they did, many books in the Library of Congress were burned. Jefferson sold his own personal library to replace the lost books. There is a Thomas Jefferson Memorial near the National Mall in Washington, D.C. Jefferson is one of the four presidents on Mount Rushmore in South Dakota. Also, visitors can visit his home at the Monticello near Charlottesville, Virginia. ↑ "Presidents". The White House. ↑ "Frequently Asked Questions about Slavery at Monticello | Thomas Jefferson's Monticello". www.monticello.org. Retrieved 2018-07-13. ↑ "University of Virginia History for kids". University of Virginia. 2008. Retrieved 31 January 2010.